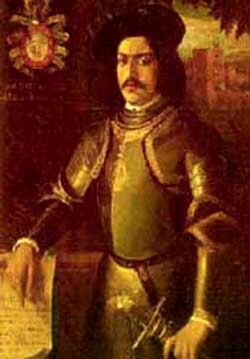 Among the noble warriors of the War of Granada in the 15th century, there was one who distinguished himself by his singular actions, Hernan Pérez del Pulgar. Upon arming the knight, the Catholic King Ferdinand disposed that on his shield he should carry a lance with a handkerchief attached at its point. This was because of a feat he performed during a foray. Hernan Perez del Pulgar, surnamed "The One of the Valiant Deeds"
At a moment of grave danger for the Catholic army, Hernan Pérez del Pulgar, seeing that the captain hesitated in advancing against the Muslim enemy, ran forward and pulled out the handkerchief that he wore around his head, Andalusian style. He tied it to his spearhead, exclaiming: "Caballeros, for those of you who are disposed to fight, here is your banner! Follow this scarf!" And saying this, he waved over his head the improvised standard and charged the Moors. 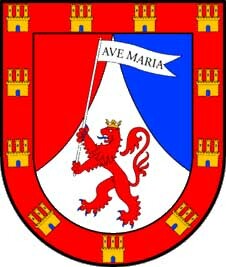 Since then, that valiant knight Perez del Pulgar was surnamed "El de las hazañas" (The one of the valiant deeds). On another occasion, with astonishing courage and agility of mind, he managed to break the circle that the Sarracens had made around the fort of Salobreña and penetrate its interior. Among the Moorish cavaliers was one named Tarfe, renowned for strength and daring spirit, but whose courage partook of fierce audacity rather than chivalric heroism. In one of these sallies, when skirting the Christian camp, this arrogant Moor outstripped his companions, overleaped the barriers, and, galloping close to the royal quarters, launched his lance so far within that it remained quivering in the earth close by the pavilions of the Sovereigns. The royal guards rushed forth in pursuit, but the Moorish horsemen were already beyond the camp and scouring in a cloud of dust for the city. Upon wresting the lance from the earth, a label was found upon it importing that it was intended for the Queen. Nothing could equal the indignation of the Christian warriors at the insolence of the bravado and the discourteous insult offered to the Queen. Hernan Perez del Pulgar, surnamed "The one of the valiant deeds," was present, and resolved not to be out-braved by this daring infidel. "Who will stand by me," said he, "in an enterprise quite dangerous?" The Christian cavaliers well knew the daredevil valor of Hernan, yet not one hesitated to step forward. He chose 15 companions of powerful arm and dauntless heart. His project was to penetrate Granada in the dead of the night by a secret pass made known to him by a Moorish renegade of the city, whom he had christened Pedro Pulgar, and who was to act as guide. They were to set fire to the City Hall and other principal edifices, and then effect their retreat as best they might. At the hour appointed the adventurous troops set forth provided with combustibles. The renegade led them silently to a drain or channel of the River Darro, up which they proceeded cautiously, single file, until they halted under a bridge near the royal gate. Here dismounting, Pulgar stationed six of his companions to remain silent and motionless and keep guard, while, followed by the rest and still guided by the renegade, he continued up the drain or channel of the Darro, which passes under a part of the city. He was thus enabled to make his way undiscovered into the streets. All was dark and silent. At the command of Pulgar, the renegade led him to the principal mosque. 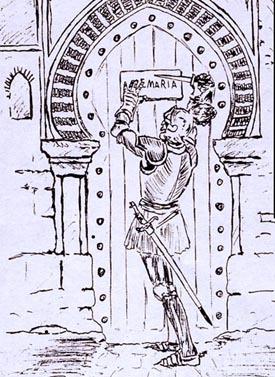 Here the cavalier, as pious as he was brave, threw himself on his knees, and, drawing forth a parchment scroll on which was inscribed in large letters "AVE MARIA," nailed it to the door of the mosque, thus converting the heathen edifice into a Christian chapel and dedicating it to the Blessed Virgin. This done, he hastened to the City Hall to set it in a blaze. The combustibles were all placed, but Tristan de Montemayor, who had charge of the firebrand, had carelessly left it at the door of the mosque. It was too late to return there. Pulgar was endeavoring to strike fire with flint and steel into the raveled end of a cord when he was startled by the approach of the Moorish guards going the rounds. His hand was on his sword in an instant. Seconded by his brave companions, he assailed the astonished Moors and put them to flight. In a little while the whole city resounded with alarms, soldiers were hurrying through the streets in every direction; but Pulgar, guided by the renegade, made good his retreat by the channel of the Darro to his companions at the bridge, and all, mounting their horses, spurred back to the camp. 1. Chapter LXXIV, Exploit of Hernan Perez del Pulgar and Other Cavaliers. In commemoration of this daring feat of Pulgar, some years afterward the Emperor Charles V conferred on Hernan del Pulgar and his descendants the privilege of sitting in the Cathedral's choir during high Mass, and assigned the place for Pulgar’s sepulture the identical spot where he had kneeled to affix the sacred scroll. His tomb is still held in great veneration. This exploit was the fragrant flower that Pérez del Pulgar wanted to leave at the feet of the Virgin in that month of May so many years ago.